If you own a rental property but had a tenant trash it when they leave then make sure you read this article because we’re addressing the all-too-common problem that landlords have when they get their rental house back partially or completely trashed. Do you own a rental property? Did you have a tenant leave it in less-than-perfect condition? Even better they probably haven’t been paying rent on time (or at all!) either. You need to first assess the damage and decide if it’s worth going after the tenant. Unfortunately, often it isn’t worth the hassle because likely it will be cost you a back of money and worse of all be a complete waste of your time to get the tenant to pay you back. It’s likely that they don’t have the money to cover it but if you can’t stand the thought of them getting no type of punishment at all (except losing their security deposit), you may choose to do this. From damaged carpet, holes in the walls to missing appliances and toilets – yes toilets. I still don’t understand what someone is going to do with an extra toilet – we’ve heard of just about everything you can imagine! You may be among the lucky ones where a little bit of drywall and paint will fix the problem, in which case you may want to fix it up and rent it out again, and then just accept this as the cost of doing business. One little-known option that is actually helpful is to find a handyman, contractor or someone that has one as a family member or friend who wants to rent the house. Then in exchange for a discount on rent (or even free rent) they can fix up the house for you to make it a nice rental property again. Make sure you have a timeline all spelled out, though, to avoid then staying too long without a lot of work getting done. 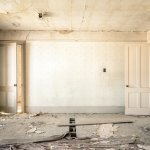 It may take you a little longer to find a renter this way but this maybe a low-cost way to get your property back into like-new condition. And hopefully they will keep the house in nice condition. Another option is to sell the house and move on from owning a frustrating rental property. However, be aware that if you try to sell the house on the MLS, you may have to fix it up first in order for the agent to list it. Another option is to sell privately to a house-buying team like ours. (We buy houses in as-is condition and we’ll fix them up ourselves). You won’t have to worry about spending money putting your property back together just for someone new to trash it again. With Triangle Real Estate Buyers, we can make a fair cash offer where you don’t have to deal with all the headaches of being a landlord. Break away from the stress from calls at all times of the day and night, vacancies, property damage, the next appliance to break, or when you are going to have to replace the roof, air conditioner or furnace. To get a fair cash offer for your property, no matter what condition it’s in, just get in touch with us and we’ll give you a no-obligation offer and we can even buy your property from you fast. Click here now and fill out the form or call our office at (919) 724-4571 and we’ll get back to you right away.